Analogue Multimeter DC/AC, DC 20kΩ/V 3-600V 100µA-500mA/10A Analogue Multimeter with mirror scale, point bearing moving-coil-mechanism and central range selector switch for easy operation. Ideal for quick measurements during servicing. 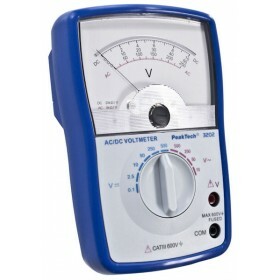 Analog Voltmeter DC/AC, DC 20kΩ/V 0.1-1000V This new series of analog measuring instruments for the work on workbenches and in classrooms in the education and training area, these devices are especially for daily use in test and measurement work through the durable ABS plastic case construction. As no batteries are required, the expense and inconvenience of changing batteries is also eliminated. 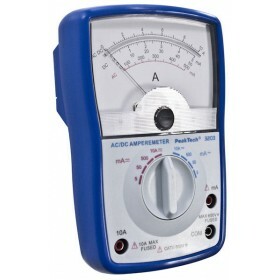 This analog voltmeter has a wide voltage measurement range from 0.1 V up to 1000 V, for measurement both in DC and in AC. The connection is done by a 4 mm safety socket, each one for the respective measuring range. Analog Voltmeter DC/AC, DC 20kΩ/V 0.1-500V This analog voltmeter provides a clear voltage display in DC and AC voltage range. Analog Ammeter DC/AC, 5-500mA/10A This analog ammeter provides a clear current display in DC and AC range. 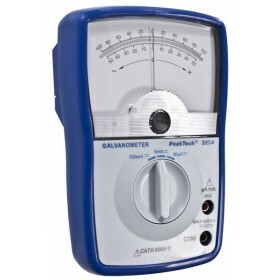 Galvanometer with Central Zero DC, ±100mV ±50µA/5mA This new galvanometer moves the pointer relative to the direct current between the positive and negative side of the scale and thus can show the current flow. Analog Multimeter DC/AC, DC 20kΩ/V 0.1-500V 50µA-500mA/10A Ranges of voltages in DC from 0.1 V to 500 V. Ranges of voltages in AC from 10 V to 500 V. Ranges of currents in DC from 50 μA to 10 A. Ranges of resistances at center of scale from 20 Ω to 2 MΩ. 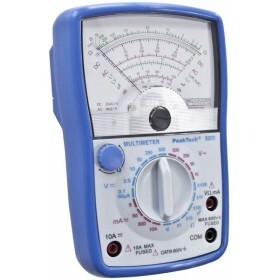 This analog Multimeter has a wide range of measurement functions, including AC and DC voltages, DC-current, a resistance measurement with continuity tester and a dB measurement. Analog Ammeter DC/AC, DC 1mA-10A This new series of analog measuring instruments for the work on workbenches and in classrooms in the education and training area, these devices are especially for daily use in test and measurement work through the durable ABS plastic case construction. As no batteries are required, the expense and inconvenience of changing batteries is also eliminated. This analog ammeter has a wide current measurement range from 1 mA to 10 A, for measurement both in DC and in AC. The connection is done by a 4 mm safety socket, each one for the respective measuring range.